Rabbi Shimon Bertman shlit'a is a native of Los Angeles and talmid of Harav Simcha Wasserman zt”l. He went on to learn in Yeshivas Bais Hatalmud in Brooklyn and later in Yeshivas Chevron in Yerushalayim. After a number of years of Kollel in Yerushalayim and Los Angeles, Rabbi Bertman served as a Magid Shiur and Rosh Kollel in a number of yeshivos in Yerushalayim catering to students from abroad. He has been a Magid Shiur for Torah Communications Network from the inception of the Dial a Daf project 30 years ago to this very day. 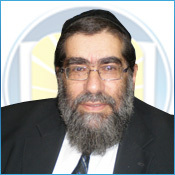 Carrying the renowned Dial a Daf concept forward to the Iyun Kal format is a unique honor for Shas Illuminated, and we are happy that Rabbi Bertman is laying the foundation for this project.